As far as Windows Mixed Reality headsets go, Samsung's HMD Odyssey was considered one of the better VR devices of its kind when it launched in November of last year. Now, it appears that the South Korean electronics giant is getting ready for round two, with a second generation Samsung HMD Odyssey headset spotted by Road to VR in a new Federal Communications Commission (FCC) filing. 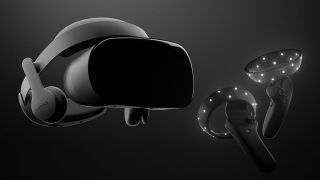 According to the FCC documentation, the Samsung HMD Odyssey Plus will sport the same 110-degree field of view and 1440 × 1600 resolution (per eye) as its predecessor. Users can also expect a number of minor refinements focusing on comfort, with the documentation listing "wider eye box, wider part of nose" and "anti-fog" among the device's projected specs – below is a diagram highlighting the differences between the HMD Odyssey Plus (left) and Samsung's first generation headset (right). Curiously, the documentation also lists the HMD Odyssey Plus as sporting an AMOLED+SFS display, though just what the SFS acronym stands for is unclear at this stage. That said, Road to VR believes that SFS may have something to do with Samsung's quest to address VR's dreaded screen-door effect. While we don't know when the Samsung HMD Odyssey Plus is set to go on sale, the fact that it's been submitted to the FCC for certification suggests that its release is probably right around the corner – stay tuned for more information.